This Talking Mats specialist training is relevant to you if you support people with eating and drinking difficulties. Each person will receive the Eating and Drinking resource which is designed to help people think about their eating and drinking and the impact on their health. This combined foundation and Thinking Ahead course is relevant to you if you want to develop your skills in Talking Mats and consider its role and application to advance care planning. 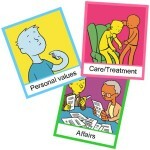 The cost of the course includes the Talking Mats Keeping Safe Resource – A powerful communication tool to help people reflect on how their lives are going; It supports safeguarding by allowing issues of concern to arise from broad discussion.